This recipe is for a lemon almond cake, or gató, from the Mediterranean area of Spain, where both citrus and almonds are plentiful. Instead of regular flour, almond flour is used, so the cake is gluten free. Variations of this traditional recipe have their roots in Europe, turning up disguised as layer cakes, tortes, and sponge cakes. This type of cake is sometimes referred to as an almond torte, and because it’s a flourless almond cake recipe, you can make it a low carb cake if you use a sugar substitute. I use palm sugar. The almond flour, also known as almond meal, ensures that the cake is moist, and stays fresh for several days. The flavor can be varied by any kind of citrus or flavoring. 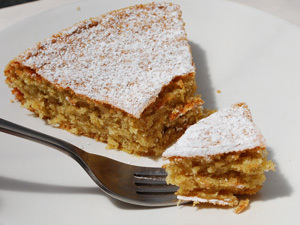 For a rich tasting almond flavored cake use 1½ t almond extract and leave out the zest and cinnamon. To make a layer cake, either make two cakes or split in half, and fill with frosting or any kind of filling and/or frosting combination. I like to simply sprinkle powdered sugar over it. pinch salt*For an almond flavored cake substitute 1½ t almond extract for the zest and cinnamon. Beat egg yolks, zest, cinnamon, and 2T sugar with electric mixer. Stir in almond flour and 2 T sugar. Beat egg whites, pinch of salt, and 4 T sugar until soft peaks form. Sprinkle with powdered sugar, or frost however you like. Ingredient Tip: Honeyville sells the most finely ground and best priced almond flour I’ve found. The fine grind makes for a smoother, lighter result.